Services - Frisco Roof Repairs - Roofing Company, Roof Repairs, and Roofing Service in Frisco, TX. Frisco Roof Repairs offer a wide range of Home Improvement services in Prosper, Frisco, and The Colony. A leaky roof on a rainy day is in desperate need of repair - The day after a notorious North Texas Hail Storm needs to be looked into. We offer these services and so much more. Send us a request for a Free Estimate using the form on the right and we'll contact you as soon as we can. Residential Roofing Services - We partner with you, the home owner, to find the best solution to your home roof repair needs and budget. Commercial Roofing Services - With Roofing Services for your business, we can raise the bar using Single Ply, Modified Bitumen and TPO Materials. Storm Damage Services - As a Reliable and Honest roofing company, we have repaired hundreds of homes from detrimental Hail Damage. Free Estimates - Hiring a Contractor can be hard to fit in a budget, so we offer Free Estimates on all work with No Obligation at the end. Painting - A fresh coat of paint can make a dilapidated home look just about brand new! We staff Professional Painters. Fence Replacement and Stain - Privacy fences serve no purpose with holes and missing slats. We can beautify your backyard in an instant. General Contracting Services - From a new work shed in the back to adding an additional wing onto your business. Siding Repair and Installation - Frisco Roof Repairs will replace the siding on your home or business giving it a new, clean look and feel. Gutters - To maintain your patios and landscaping, gutters are very important. We can repair, replace, or do new installations. Windows and Screens - Consider your electric bill; we can give you a fair and competitive estimate on new windows on your home. Garage Doors - They seem to always break! Let our Master Garage Door Repair guys take a look, and you won't be having any more problems. Flood/Water Restoration - In the event your home or business was damaged by flood waters, we can repair. We work well with budgets also. Complete Storm Restoration - Storms can affect all areas of your home; roof, windows, doors, etc. We can give you an extensive Free estimate for Storm Restoration of your home, with no obligation on your end. This is the location of the roof, which may not necessarily be your residence address. Please let us know for what type work you would like us to provide you an estimate. ie: Roof Repair; Roof Replacement; Leak Inspection; Maintenance; Ventilation Inspection. Frisco Roof Repairs replaced my roof and most of the roofs in my neighborhood back after the last hail storm, and they did a really good job and they got it done quickly. Frisco Roof Repairs has completed two roofs for me in the past 3 years along with exterior painting and new gutters. Each time I was treated fairly and with respect. The jobsite was left clean and the work is impeccable. I love my new roof! I have recommended Frisco Roof Repairs to many of my neighbors and friends. 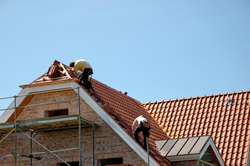 Frisco Roof Repairs is a part of Maximum Construction and Restoration.